His offence? 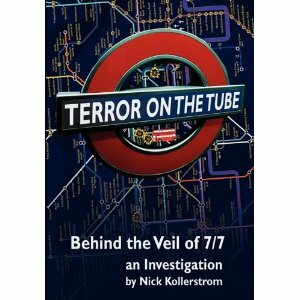 He had sent six DVD copies of his film ‘7/7: The Ripple Effect’ to various persons at the time (in 2008) of the trial in Kingston of three ‘terror’ suspects, alleged co-conspirators with the London ‘suicide bombers’. The DVD’s were intercepted and never reached their targets. The Kingston suspects were found innocent (only to later be retried for the same offences, but that’s another story). Muad’Dib’s trial started on Monday 9th May, with a challenge to the monarchy and, hence, the authority of the court. This was ruled ‘out of order’ by the judge. On Tuesday a jury were sworn in. On Wednesday they watched all of his film, ‘The Ripple Effect’, in open court. Over the Tuesday and Wednesday the jury heard in-depth discussions of both 7/7 and 9/11, with Mr Hill laying out clearly, and at his own leisurely pace under cross-examination, the reasons he believes that both these ‘attacks by terrorists’ were, in fact, false flag attacks by agencies of the state against its own people carried out with the purpose of providing a pretext for invasion of innocent countries in the middle east in order to control their natural resources. This was surely the first ever fully-explored set of such allegations of false flag terror made against any state before an ordinary collection of the citizens of that state. It is also clear from the verdict that, when such information is placed before such ordinary citizens the majority of them ‘get it.’ The jury had announced that it could not be unanimous, so the judge allowed a ‘majority verdict’, i.e. ten or more of the 12. It is surely not unfair to deduce that Southwark Crown Court’s jury of ordinary persons did not reject Muad’Dib’s false-flag narrative as outrageous or even necessarily untrue. One wonders how many of that jury have now themselves been converted into active ‘troofers’? During the trial (on Wednesday) JAH/Hill/Muad’Dib was asked why he moved to Ireland: “To pursue my study of the lost Ark of the Covenant” was his reply. Here is a character, both serious and refreshing, who brings a mythic dimension into life. Onlookers were impressed by the way he was able to conduct himself without fear in the witness-box, sometimes pausing 5-10 seconds to reflect, before replying. A group of up to 25 supporters attended the four days of the trial, a couple travelling from as far afield as Finland and the state of Montana. Let’s hope that will be the end of the persecution of Mr JAH by the British state – and, that he soon starts on a 2nd edition of his Ripple Effect. It’s the opinion of Sheffield University social-sciences professor Ridley-Duff, that Mr Hill’s Ripple Effect’s narrative of what happened on that day, is more plausible and better fits the facts than did the BBC’s 7/7 ‘Conspiracy Files‘ program. His well-referenced study focussed very much on what happened at Canary Wharf on that morning, seeing the Ripple narrative, whereby the young alleged bombers had been inveigled into a terror drill that morning, then fled to Canary wharf where they were shot – as the best account yet. The new 3rd edition of my book Terror on the Tube endorses this view. In contrast, the so-called ‘July 7th Truth Campaign’ has scoffed at the Ripple narrative calling it ‘evidence-free conjecture,’ a quite breathtaking (and very revealing) remark. 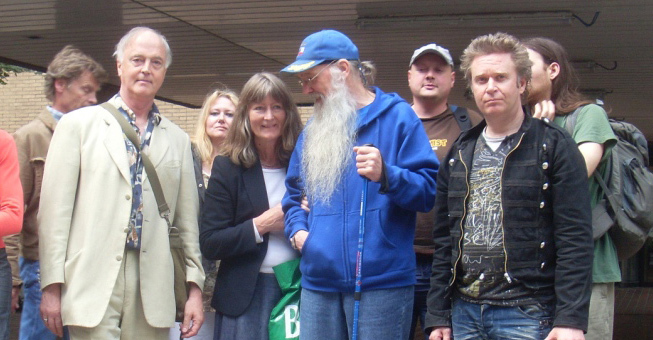 Outside Southwark Crown Court, Muad'Dib with supporters: me NK on left, Belinda centre, Mark (www.landofthefree.co.uk) on right. they could choose to withhold the information as they saw fit. The fact that both packages were sent “in care of the court” to the court address is important and one of the reasons this was such a ridiculous charge. So it was all above-board, sent through the proper channels, and not sent directly to the judge or the jury foreman in some underhanded way. johncharles@rock.com Any help in this matter I thank you for in advance as it will be a large step for freedom for myself and all of that battle the TYRANNY in the world. I just recently came across this case precedent on the Anthony John Hill case from 2011. I also came across your comment on the bottom threads, and wondered if you found a copy of this case, and did you have the chance to use it in court in Canada? I have a case in court i’d like to use it on as well. Invoking the Power & Protection of AA Michael!! “I DO NOT CONSENT”: NOTICE TO PRINCIPAL IS NOTICE TO AGENT NOTICE TO AGENT IS NOTICE TO PRINCIPAL!This private email by the Executor, in the Original Jurisdiction, registered in the Rolls for the Court of Chancery, establishes all the facts on record that I am alive with Thirteen (13) supporting Living Witnesses, is protected under the jurisdiction of the Office of the Postmaster General, Divine Province, is an International Peace Council established under the “Universal Postal Treaty For The Americas 2010” operating under the authority and protection of the Papal Seal of Peter under country code DVN/DP/999. All members of the Council are at peace and no-threat as a terrorist to the United States and the many franchised County, City, Towns and States thereof. PLEASE TAKE NOTE, you are bound and liable under the following, to wit: TITLE 18, Part I; Chapter 1 Sec. 1.; Sec. 11. & his FEE SCHEDULE NOTICE.Testator’s WILL in Probate Court shows he is alive. The appointed Judge is to protect the Testator and/or Estate at all times. Any and all aggressive acts against the Testator and/or Estate will be overturned immediately. Agent has first lien on the all caps name. Any unauthorized use must pay-off the 1st lien of 10 Billion Dollars. Any unauthorized use of his copyrighted name will be fined $25,000 per occurrence. Agent has accepted for value as not being the liable party and is unalienable for the signature of the Social Security Card/Number. BE FOREWARNED: His Property is equipped with SURVEILLANCE CAMERA’S and NO TRESPASSING WARNING SIGNS, TITLE 18, Sec. 241 & 242, TO TRANSMUTE ANYTHING THAT IS NOT OF LOVE. I wonder why you somewhat and deliberately skimm over who John sent the DVD to? For obvious reasons contacting a member of the jury during an active trial is against the law. For the same reason jurers are not allowed to discuss a trial procedings outside of the court & fellow jurors. It is a very serious crime. I can’t believe that you are ignorant of any of the above facts. John Hill may well be right, I’m not commenting on that, just on this glaring slanting of the facts by your site verging towards propaganda and away from ‘truth’ that you seem to hold dear (if it aligns with your slant on things). There are plenty of ways to make an opinion heard, various internet sites and it’s inexpensive to produce the more tangible DVD/CD media these days. Jury tampering might seem the most direct route but is obviously and necessarily illegal in all justice systems. OTT reaction by the authorities? Almost certainly, John should sue for compensation and I’m glad the English jury excerised the right of Equity but Mr Hill didn’t help himself with incidental attacks real or otherwise on the legitimacy of the monarchy and 9/11 false flag references. Save those fights for another day. You miss the point. He didn’t contact the jury. He sent the dvds to the court. The court naturally didn’t pass them on. You have miss understood the point of sending the dvds to the judge & court clerk. Mr Hill DID NOT send to the Jury I don’t know how you could come up with that idea unless you have some veiled derision in mind. Is that case number available? John? All I can say is WOW! And please do post the case number so it can be referenced by all. Based on Hillsborough nothing would appear to be close to the truth. It is a “landmark” case; thank you jury for not accepting the ludicrous charges. Mr Hill has endured the state’s illegal incarceration tactic. He has remained calm, which is essential to avoid their devious drug “therapy”. He has proved, beyond any reasonable doubt, that the state has actively sought to foist a false narrative on the people of Britain and the world; He was simply not accepting that absurd narrative. He was seeing through the fog of deception, which certainly is not a crime and is considered a quality, when applying for Oxford. This webpage (https://terroronthetube.co.uk/2011/05/12/muaddib-acquitted/) presents one of THE most important webpage reports in the history of the internet and of modern times. This is shocking, if Elizabeth isn’t The Queen, what jurisdiction does the police and social services have?